Whether you're getting quotes from car dealers, setting up an online dating account or returning a work call from your personal phone, there are times when keeping your phone number private makes sense. Fortunately there are options for short term anonymous "burner" numbers, virtual phone lines and caller ID blocking. Here's what I recommend. 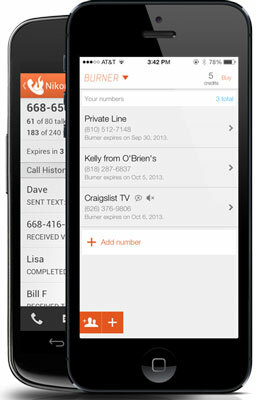 For a temporary disposable number, I like Burner (free on iTunes and Google Play). You get 20 minutes of talk time and 60 texts over a week for free and then you need to buy credits to extend service and buy new burner numbers.There's a Mini Burner ($1.99 or 3 credits) for 14 days or 20 minutes or 60 texts, whichever comes first, a Standard Burner ($3.98 or 5 credits) for 30 days or 150 texts or 50 minutes, whichever comes first, or you can pay $4.99 (8 credits) for 30 days of service with unlimited texts and calls (or $3.99 per month if you commit to a year of service). If you want to be able to send photos, there's a Picture Burner package (8 credits or $4.99) for 100 messages (with or without photos), 50 minutes or 30 days, whichever comes first. There's a text-only plan with 250 texts (no pictures) for $3.98 (5 credits). Credits can be bought in packs of 3 ($1.99), 8 ($4.99), 15 ($7.99) and 25 ($11.99). For a more permanent calling solution, I recommend Google Voice. You get unlimited calling within the U.S. for free as well as voicemail, call screening and do not disturb, among other features. To receive a call or text, you'll need a smartphone or computer with Internet access and the Google Voice app. Or, you can choose to forward all of your Google Voice calls and texts to an existing number. Outbound calls will show your Google Voice number, instead of your real one. If you don’t want to use your disposable phone number minutes, you can block your outbound Caller ID by turning it off in your phone’s call "settings" on your mobile phone, setting it up in your phone management software if you use a digital phone service or dial *67 before the number on a regular landline phone or cell phone (for both you'll need to use the country code, so it would look like *6712125551212). Your number will appear as unavailable. 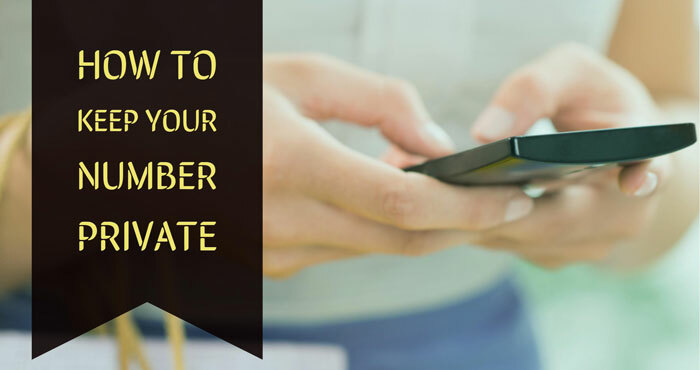 Here are steps to block your number permanently on Android, iPhones and landline phones. This reminds me of the problems I had with my mobile number to use WhatsApp. My number was disseminated and began to receive hundreds of messages from unknown numbers. Until I moved to BBM for Android. Now I have less friends but the spam to ceased to follow me. I have called various businesses using *67 and some could identify me. EBay’s automated system can identify your phone number even if blocked by *67, so don’t use a phone line where you wish the number to remain private from business entities. call me private number.What is private number? Hi, this is a moderator. Why are you spamming the chat? It is unenjoyable for everyone. Why do you give bad information? *67 does NOT always block caller ID. eBay and Allstate Insurance are 2 companies that it doesn’t work with. Dialing *67 won’t block your caller ID when calling toll-free or emergency service numbers. We updated the story to make that clear. *67 only works when dialing number within the United States. The link to Babble.ly goes nowhere. The service died? Yes, just checked and the service is dead. If you have an iOS device, check out RingMeMaybe http://www.ringmemaybe.com/. You can create 2 free numbers. Each expires after 7 days. It’s working in India or not? When I dial *67(my friend no) then automatically call end.this idea is not working for me.. Please help me about private number. The advice for hiding your number from caller ID here is for the US. You should contact your phone carrier to get advice for your specific situation in India. Some countres #31# before number dialed works as unindentified. please try that or search in your country list of shortcodes, what number will block identification. cheers. Use my 3G data card number when registering at a website. It can only receive incoming texts so I can use that to authenticate (for OTP). Incoming calls are barred by plan. So people trying to call in would give up on first try. Install truecaller and update your contact details. I have set my name as “private number”. Many people use truecaller now here and its really popular. Unless that person has my number saved, he/she sees it identified as “private number”. I want my phone to show “unknown” or “private” when I make calls, but the settings you specify that I need to change in CallerID do not exist on my LG Stylus phone. *67 always results in “this is not a working number, please hang up and dial a working number”. So….....how do I get this phone to show “unknown” or “private”?????? How can i have identification restrictions on my phone.But the network I use is Vodafone. I have been monitoring our phone bill bc my husband had some reg. Numbers from a women. After I brought it to his attention, funny names came up to old numbers I was tracking. I also notice 2 or 3 toll free numbers calling frequently. When I tried to verify the toll numbers I received 0 information on these numbers. I was wondering can ppl buy the toll numbers to communicate without getting regular number tracked.